On the construction site today we take a look around the house to see the workmen hard at their jobs, completing the Chelsea house as we speak. A construction site can be a messy and noisy environment. It is not somewhere you will want to stay for any period of time and your clients will want to spend even less time there for the same reasons! If you are going to have any meetings with your clients on site, it is a good idea to get these done first thing in the morning and to keep these meetings to a short time. Naturally as it is the client’s home, you want to spend time with them and you may well have questions for them. But it is important that you do not delay the builders in their work and you get out of the way when they need you to be out of the way. Most clients understand this, but sometimes you will need to speed them along, move them in and out of rooms and sometimes convey the sense of urgency that you have. Deliveries are one of those things that most builders will handle on their own. But it is good for you to know when things are arriving or have arrived so you can check them over visually, just to make sure that the right thing has been delivered. We are expecting the carpet runner in today and a few other smaller items. Clients often like to see deliveries coming in and you will feel them watching you whilst you check things over just to see, from their own point of view, that you are doing a good job and getting things done for them efficiently. Naturally you won’t be around for every single delivery and normally you don’t need to be, but you should make sure that you are up to date with what is happening at the property, if you are to meet your clients there. Today, I have a meeting with the client on site to discuss some joinery. I will also be meeting the carpenter himself to discuss his part of the project. 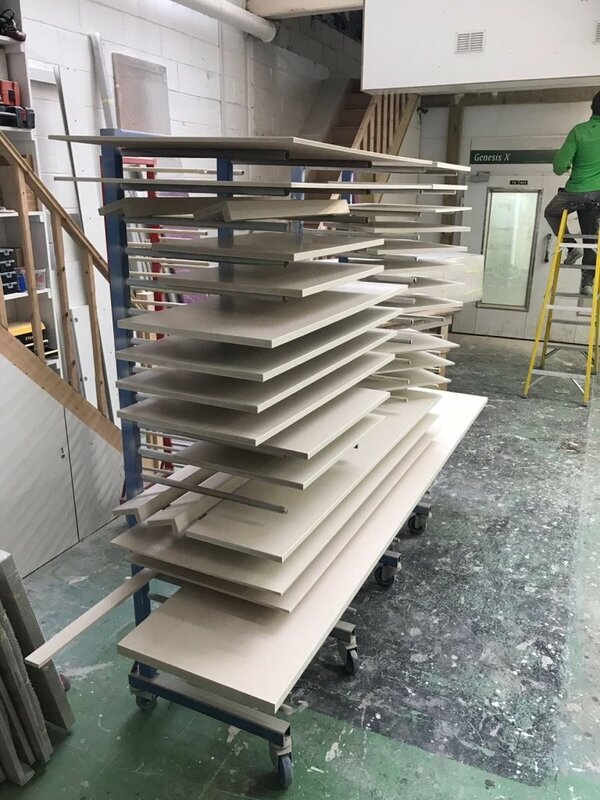 Here are some of the sides of the spray painted joinery drying after the spray paint has been applied..
Today was actually quite a funny meeting. It’s often the way that when you are handling a large and complicated job such as this, you often have a queue of people to see, ask questions, answer questions and clarify issues that have come up. In this instance, the joiner had a variety of questions and issues which I answered. My workmen know better than to leave the construction site without checking with me, as to whether there is anything else that I want to speak to them about. Thankfully we all laughed. You can become flippant when things are fast moving and you are anxious for people to be on their way, getting down to their jobs. And it is not the first time that I have dismissed a client from their own home – but perhaps not quite so crisply as I did this morning! 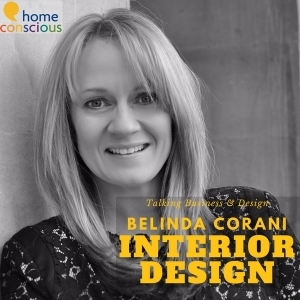 Carpet Runners – Templating – What’s Involved? The carpet runner is from a company called Alternative Flooring. They are fairly well known in the UK and provide carpets, rugs and other flooring in a variety of finishes, colours and textures. Carpets arrive in rolls and this is why it’s important to alert builders and crucially have a space for the carpets to sit whilst other work is going on. The only reason I have allowed the runner to arrive at this stage is because we have a perfect place for it to go. This is the garage which is attached to the property. it’s currently being used for a variety of things including workmen’s tools and other large items that we cannot accommodate in the house itself. It will actually only be in the property for a matter of hours. This is because my carpet fitter and installer is coming today to complete the template for the stair runner. Runners for stairs need to be templated if they are not being fitted edge to edge. That is, right up against the skirting on one side, to right up against the banisters on the other. If you are having a runner with a border, whether that is a cotton tape, suede, leather, or just bound; you will need to get the templating done a few weeks before the carpet is to be laid. No one generally tells you how long things will take unless you ask. When I first started doing this job, I didn’t really have any idea that you couldn’t just get the carpet in and expect the fitter to template, bind, stitch and finish the border; plus install it at the same time. It may seem crazy but it just didn’t occur to me. Now I know there is a procedure that has to be followed. Very much like curtain making and installing, carpets and runners need to be discussed with the fitter early on. This means that you can get your fitter and installer into the property and show them where they will be working, so they can give you accurate measurements of how much carpet you will need. 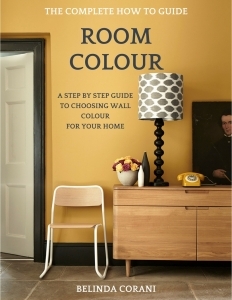 You may not have even decided what carpet is going to be in each room. The client may not have even thought about it. But getting your installer in early is an extremely wise thing to do. Not only will you get a first look at the quote and how much money you will be charged, but you can discuss underlays, piles, edging, thresholds, installation times and even door height with your installer. He will tell you how long things will take, he will give you advice as to what will work and what won’t work and will also relay his work schedule so you are aware of when you can and cannot book him. I always ask about holidays and whether someone is going to be available. I always ask how much notice they will need and I will follow this up with either an email or a text message to confirm as and when things go in the diary and things such as carpets are being delivered. Today my carpet fitter, Lee, will be dragging the roll of carpet into the house chopping it up into the various parts that he will need. Then he’ll pack it into his van to be taken away to be bound with the cotton tape that the clients have chosen. The most important thing to note when this is happening is that you will need an empty house for this to take place. It CANNOT take place during the day when the workmen are going up and down the stairs and in an extremely messy building site. It is also for this reason that templating is often done late at night as this was the case today, or it takes place at a weekend when there is no one around to disturb the installer whilst he is working out measurements and quantities that he will be using. Templating should only take a couple of hours, depending on the size of the property, and sometimes it will take a lot less. It is for this reason that often carpet templating is done either right at the beginning of a project or more likely towards the end when all building work has been confirmed and there are no more structural changes to be made. By all means get a quote at the beginning but make sure your fitter comes back once the work has been done so that his measurements are accurate. Remember the onus is on the installer to get this right and you should not disturb him not interrupt him whilst he is doing what he needs to do. Use this quiet time in the house to see what work has been completed and to make a note of anything that you want to talk to the main contractor about. Take your time with your fitter go through everything with him; including whether carpet is to change from one type to another (as it is in this case) or if you have a bathroom (which has tiles and waterproofing and underlay) and is sitting next to a room with carpet. Often he will need to order specialist thresholds that will hold both the tiles and the carpet in place. Now is also the time to talk about quality of underlay and what finish you would like the threshold to be. Thresholds are the metal bars that sit on the ground in doorways. They come in a range of finishes from chrome, polished brass, antique bronze and white plastic to name but a few. Make sure you match these to either the carpet or most usually to the power and light switches and sockets. Once he has all the information that he needs he will probably tell you that it will take between 2 and 3 weeks for the runner to be bound or taped and be ready for installation. I often ask my fitter whether he will be able to hold my runner just in case I need a few more extra days before the carpet is installed. Towards the end of a project, things move around in the diary considerably and it is wise to give yourself some leeway as to when you can book in a carpet installation or a runner installation. The house will need to be empty so that the carpet fitter can move from room to room with the enormous amount of excess carpet and underlay that there sometimes is on these projects. There will be tools on the floor, along with gripper, nails and other sharp objects that you do not want anyone to step on, let alone children. Make sure no one is in the house. Quite honestly, runners and carpet of any type should be one of the last things ever to enter a property before the furniture comes in. You don’t want anybody stepping on your new carpet, least of all builders completing their snagging lists, running up and down the stairs on your newly installed carpet. I often speak to my clients and say I’d rather all of your furniture items go in before I put down the stairway runner. Most clients are happy for this to take place later as they know workmen delivery companies and removal firms will often ruin new carpets as they are running in and out of their new property. Think what could happen if it’s raining! This particular runner will be installed a week after the clients move in, with the clients’ agreement. Even though they have two small children, it is better that any messy work takes place before the stair runner goes in. So this roll of carpet will arrive today but will have it’s special time a good month from now. 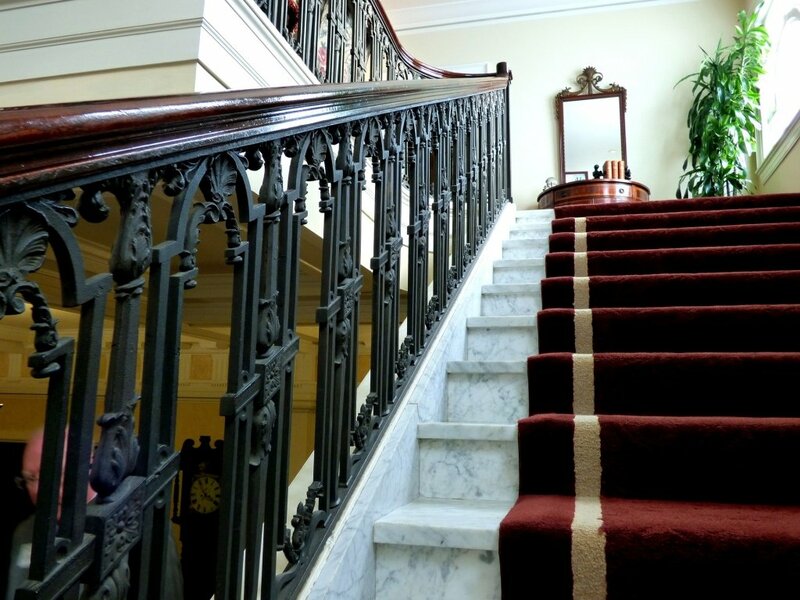 One last thing to note on carpets and stair runners; you should check with your fitter as to whether he will collect the rubbish and the excess waste and indeed whether he will actually be vacuuming the carpets after the fitting has been completed. Many fitters do not do this and so this will either be left to you or cleaners to do this job directly after he has finished. Be careful if you are using cleaners with their own vacuuming machines as these attachments could be dirty and could mark your new carpet. As with any cleaning companies you must watch them like a hawk to make sure that they are not damaging the new items that have been installed. To be honest, I often do the vacuuming myself. I will often use the larger pieces of excess carpet, the strips that are usable, and I use them as miniature rugs to sit over the top of carpet to protect them as much as possible. All other scraps of underlay etc can go into refuse sacks and either be taken away by the workmen, your installers or your local authority. Be aware that this waste can be seen as commercial waste and there may be fees that apply for their removal and disposal. .
Today we see almost all the underfloor heating that has been installed in the main reception room. You will see the insulating foil pads between the white flexible piping that carries the water to the four corners of the room. It’s important for your electrician to know when this underfloor heating will be installed and for him to speak to the installers, so that his wiring can be accommodated within the underfloor heating network. I have in-floor up-lighters in places, within these two main reception areas. So I put the two installers together to make sure that they are all on the same page and each of them knows what the other one needs and how things are going to work. This is basic project management. You will be amazed at how many people do not think to put one trade in touch with the other so that the project runs smoothly. Underfloor heating also means that you will have to have somewhere for the manifold to go. A manifold is a range of valves, gauges and pumps that manage circulations, temperatures and pressures within an underfloor heating system. This is what one looks like. You’ll have to find somewhere for this to go. Most probably in a cupboard. Check with your contractor about the possibilities of where this item will go; but do this early on when the place is still a construction site – not when they’re already putting the flooring back down! Today we also see that the Master Bedroom windows have been taken out in preparation for the new windows that are going in. Some of the plaster will need to be taken off and edging and casements will need to be sanded down, in order for the new windows to fit in the old spaces. The new front door is also taking shape with the new fan light and the new decorative surrounding. It will need to be painted black as per the client’s instruction, but that will happen later in the project. Also on the construction site today is the tiler. You will see in the family bathroom, the white ‘Metro’ tiles have already been put onto the walls. Currently the bathroom installer is constructing the joinery that is to be fitted in a small alcove within the family bathroom. This is to give the family that utmost closed storage that they can get in this bathroom. The white tiles will have their grouting finished once everything is in place in the bathroom itself. Meanwhile, in the Guest Room, we see in the video the tiler constructing the mosaic limestone tiles above the single basin. When tilers are at work there is enormous amount of tile dust in the air. It looks very much like a steam room, if you know what one of those looks like! All the joys of a construction site are here today! It’s a very fine dust and not all tilers wear a mask to do this job. Even with windows wide open there will still be tile dust in the air for hours afterwards. Most of the larger tiles in the guest room have been completed and you will see that this guest room does not have a tray in the shower area. The clients wanted this space to be a wet room so the tiles have been elevated and have been cut to form a funnel, so that the water will flow into streams and flow down into the central drain. The last things that will go on in any bathroom are generally the attachments and the flush plate for the toilets. Only then can you test the showers out to make sure things are flowing and that things are as watertight as you need them to be. I always get nervous but the boys have never let me down yet! Also coming up today is that there are lots of diary changes taking place at this time. When you are in the thick of a project or even if you are completing two at the same time, you will often find that you are diary managing (or juggling!) as much as is possible and having to be flexible with your time as well as other contractors. You will spend enormous amounts of time on the telephone, on text and on email confirming and waiting for appointment slots to go in and out; just so that you can finish off your project. It is not necessary to alert clients to every little change or indeed to alert them when there is a big change; unless of course it affects their moving in day. In which case you will have to have good reasons and solutions to the problems that may arise from such changes. After a busy morning on the construction site I needed to pop off to a supplier and whilst I did that, I took some time to look at some architecture. I’ve said it many times before but it is very important that you look up at buildings rather than down at the ground. The rich architecture that surrounds you, whether it is new or old, will often be the inspiration for some of your interior projects. Whether you are using curved furniture to reflect the mouldings on the exterior of a building or whether you were using exposed brick inside a building to match the exposed brick on the exterior of a property, the similarity between the interior and exterior is all important. Always look up, especially if you are on a bus on a train in a taxi or a car. Architecture is one of the most important environmental factors we have in our world today. Good design on the outside of the building can be let down by bad design in the interior spaces. London has such a history and a wealth of architectural styles over the centuries that there is nothing in this city that you cannot find. Despite the current mania for glass and steel blocks, whether for housing or for commercial buildings, this type of construction is perhaps one of necessity given budgetary concerns. But what previous generations knew that perhaps we have lost sight of, is that ornamentation and decoration can lift the spirit before you even enter a building. Workmanship will stand the test of time both practically through the elements, and intellectually, when future generations gaze upon the intricate details that someone has seen fit to install – using colour, finish, texture and form. Sculpture, paint and glazing can transform our spaces into historical art installations. Use them in your projects as well as encouraging architects to add decorative details to their designs. Most designers are rightly concerned with the interiors that they are engaged to complete. But few consider the outside of buildings to form their judgement when they are designing the interiors. It’s a funny thing but often it is the interior designers who are educating their clients as to how building is thought about constructed and read. The breadth of styles is so huge that you could argue that the world is your oyster when you are designing an interior. But you have to start somewhere and I would implore interior designers to recognise that’s some interiors do not lend themselves towards the new open plan interiors that we have all become used to over the last few decades. Indeed small dwellings means smaller rooms and you should adapt your designs to fit within the walls; utilising spaces well and of course utilising modern technologies. But have a care to at least respect the original architecture and personality of a building. There are plenty of ways for you to show off your creative talents without ripping the fabric out of a building and without respecting the exterior of a property. On this walk we see some beautiful Victorian properties rendered in white stucco and we see some mid-victorian red brick mansion blocks that are so desirable to live in that present governments are trying to replicate these buildings, with limited success. You will also see exterior lighting and also garden design when you are viewing street architecture. Exterior lighting usually involves hanging pendant. A lantern, as seen in the video, is one form of doorway lighting, but this area can also encompass garden lighting and task security lighting by doorways, gates and pathways. Trees, shrubs and flowers also make an appearance on the exterior of a property and although it is reasonably common these days for owners to cut down trees because they fear that they’re roots will destabilise the properties, this is rarely the case. Often trees soak up the moisture from the weather and prevent it from saturating a property with damp. Not only this but they provide a fantastic barrier for noise and soak up much of the carbon dioxide that is produced by the vehicles of today. If I had the chance to stop tree felling and hedge removal in front gardens then I always do so. Again, when the property was conceived and built, the workmen on that construction site knew what was best architecturally, visually and practically for that property. It is only us in this day and age that think we know better and reap the consequences. As a designer, it is up to you to use your power of influence carefully, and not to the detriment of the buildings around you, most of which will outlive you and your business. Be kind to the properties that you work with in. Respect their heritage and their materials and conserve the history for future inhabitants and designers to learn from.